In our latest competition both a Weatherbeeta Pro Air Front boots & Prolux All Purpose Saddle Pad are up for grabs for one lucky winner. The Weatherbeeta Pro Air Front Boots are light, tough with a durale outer. They have breathable micro perforated neoprene lining that contours to the horses leg for maximum comfort and protection, with vents for breathability from the inner layer to the outer shell. The machine washable WeatherBeeta Prolux All Purpose Saddle Pad is made of Soft and durable suede polycotton outer with a wick away lining to help keep your horse cool, dry and comfortable. 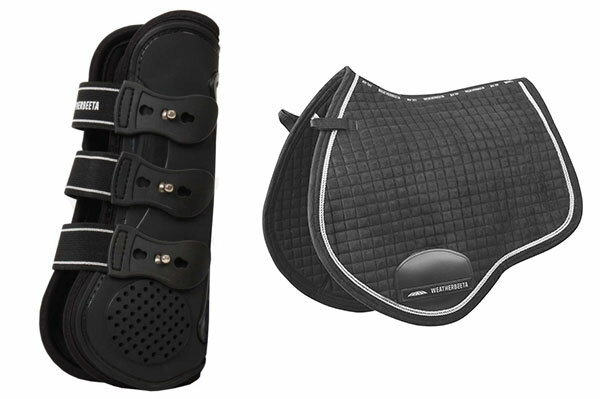 It has a breathable mesh spine for extra airflow and a PVC covered girth patch for added durability. To be in with a chance to win this amazing bundle of prizes register down below. Entry for this competition ends on the 9th December.